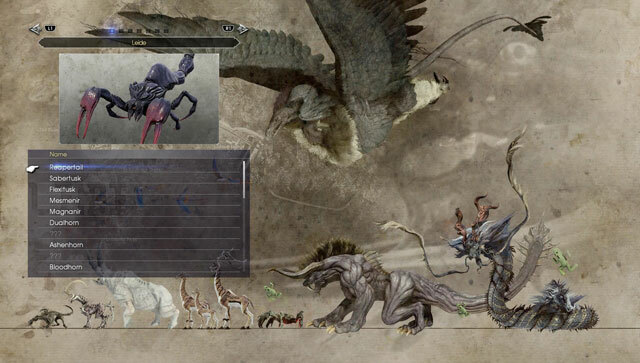 Final Fantasy XV got a bestiary in update 1.15. It shows all the creatures you’ve encountered during your time in Lucis, along with some info about them – what they eat, where they live and such. It’s a really nice addition to the game. You can find this encyclopedia in the archives menu. Some players will want to complete the list of monsters – if you’re one of them, keep on reading for our FFXV Bestiary missing monster locations guide. Note: This guide is a work in progress. We’ll update it when we have more info. Reapertail – Lives in dry climates, crawling through the sand. Coeurl – Usually found in plains and forests, like Thoemmels Glade. Daggerquill – Can be found in Keycatrich Ruins, during the Dust to Dust quest. Cactuar – A rare enemy that appears in areas like Longwythe and the Weaverwilds. Jormungand – A boss in the Crestholm Channels dungeon. Bennu – A boss in the A Legend is Born quest, in the Three Valleys. Behemoth King – A boss in the Cure for Insomnia main quest. Adamantoise – The mountain near Hammerhead. Not on the mountain – it is the mountain. Dynoaevis – Encountered during the Archaean main quest. Gigantoad – Encountered during the Professor’s Protege side quest. Kujata – Can be found in the Mencemoor area. Phalaris – Found in Crestholm Channels. Jabberwock – A boss in the Costlemark Tower dungeon. Rogue behemoth can only be found in the perfect cup quest. Also, the one before rubyshears is stoneshears, which is found on the beach near the galdon quay haven. The one before Rubyshears is Stoneshears. Found along the coast at Galdin Quay, near the camp. For the Rogue Behemoth, pick Meat during the Perfect Cup sidequest. You can replay this by choosing Chapter 8 from chapter select and going straight to the Cup Noodle stand after doing the Plant mission. You forgot the Thunder Bomb between Ice Bomb and Galvanade. Thanks. I also forgot Cryonade after Ice Bomb. I must have skipped forward without noticing while copying. Yes, it’s a red Bannerman (white, red and silver with an antennae), but I don’t remember where to get them. It supposedly drops from drop ships in chapters 5-8. Unfortunately I think it’s tied to player level, which means it’s permanently missable. Nothing but the high level Bannerman appears in chapter 5 onward and nothing but the level 6 one appears before then. Found the missing Bannerman in Chapter 4. Choose chapter 4 from Chapter Select and start farming Drop Ships. The enemies will be of the lowest level, such as the level 6 Bannermen. I killed maybe about a dozen Drop Ships and didn’t see a difference is spawns. Upon reloading the save a couple days later I immediately noticed Drop Ships were now spawning level 16-18 enemies. Farmed until a Bannerman appeared and voila. It was the level 18. There can also be multiple entries per type. Inside Sabertusk there Sabertusk Alpha, Sabertusk Beta, and Sabertusk Gamma which you can navigate using left and right directional pads. I’m having trouble completing my bestiary folks. Like the ma-x angelus-0 will not spawn. Daemonwall I have no clue where that is. Smae with the Kokyangwuti.the Gurangatch.im at level 120 for all my characters. So far I only have 1 magitek suit. Not even the better 1. I replayed the whole story. I’ve done all the dungeons even the special dungeons. I have the flying car. All my skills are level 10 my chocobo level is 10 my hunter is only 9 though. I am also having some difficulty finding new hunts.i also have all the vortex weapons. Which surpasses all others in the game without a doubt. The only side quests I have to finish I think are the ones for sania and holly. And w.e ones the game throws at me for finding hurt people or the broken down cars.